I have been wanting to put this story together for some time and it is now January 2017, and a weekend snow is predicted and I have some free time. On May 30, 1907, the equestrian statue of Major-General J. E. B. Stuart was unveiled in the city of Richmond, Virginia on Monument Avenue. This statue is at the intersection of Franklin and Lombardy Streets. This project was spear headed by the Veteran Cavalry Association of the Army of Northern Virginia. This organization was founded in the year 1891 with the specific purpose of erecting the statue of General Stuart, to honor a most magnificent soldier. The artist and sculptor, was Fred Moynihan. On hand for the dedication was: Mrs. General J. E. B. Stuart (Flora) and Mrs. General Stonewall Jackson (Anna). Granddaughter of General Stuart, little Miss Virginia Stuart Waller, unveiled the statue. Major Andrew R. Venable presided, Rev. Walter Q. Hullihen offered the prayer and Judge Theodore S. Garnett delivered the address. All of these officers were members of General Stuart's staff in 1864. 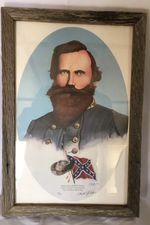 The speaker, Garnett, was with General Stuart at the battle of Yellow Tavern, May 11, 1864, and assisted in bringing him, mortally wounded, from the battlefield to Richmond, where on the following day, the General died. James Ewell Brown Stuart was born in Patrick County, Virginia, on the 6th day of February, 1833. He was the youngest son of Archibald Stuart and Elizabeth his wife; and whether or not our democratic simplicity attaches any significance to his alleged decent from the royal line of Scotland's kings, we who know this true son of Virginia make bold to declare that no prince of the blood ever did more honor to an illustrious ancestry. Strong in mind and body, educated in three cardinal virtues of Virginia youth, he grew up to manhood a splendid specimen of the hardy young mountaineer, and fresh from the meadows and pinnacles of the Dan, he took his place among the boys at West Point, and there learned the science that teacheth the hands to war and the fingers to fight. The Stuart-Mosby Historic Society (www.stuart-mosby.com) completed the campaign to restore this statue in 2016. The estimated cost of restoration was in the neighborhood of $35,000. Most of this money came from anonymous contributions from Civil War enthusiasts and historic minded citizens. 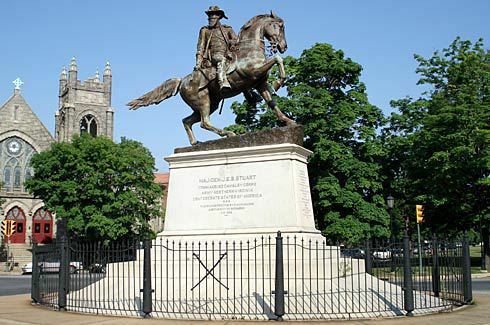 The Stuart statue is one of a series of monuments on Monument Avenue that annually attracts thousands of visitors to Virginia's Capital City.